John fell in love with the Camp Manito-wish property as a ten year old camper in Timberlodge Cabin. 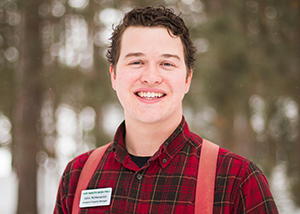 For fourteen summers he has returned to Camp as a participant, counselor, sectional, outpost leader, and more recently as a year-round maintenance assistant. As the Assistant Property Manager John is excited to continue the legacy of those who came before him and help launch Camp into its next 100 years.